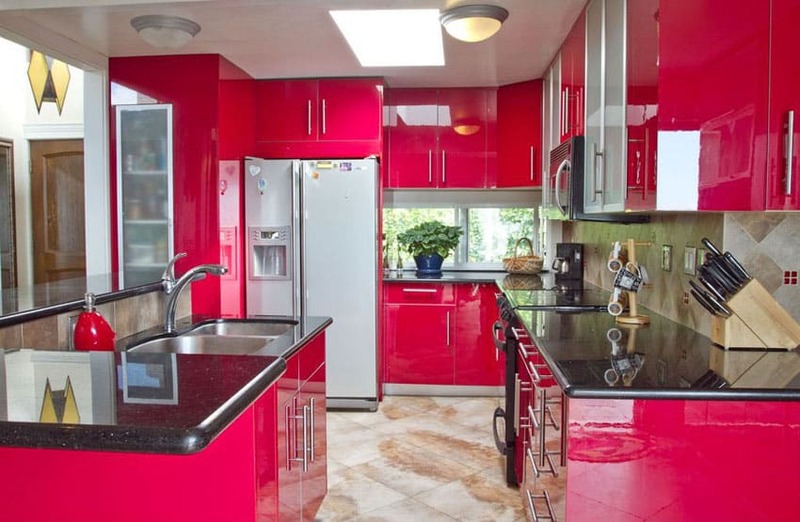 Welcome to our gallery of red kitchen ideas. The color red fascinates the interest and is associated with intense feelings and emotions. As a stimulant, red is the hottest of the warm colors with the ability to instigate good conversations, stimulate and increase appetite and brighten the whole work space. 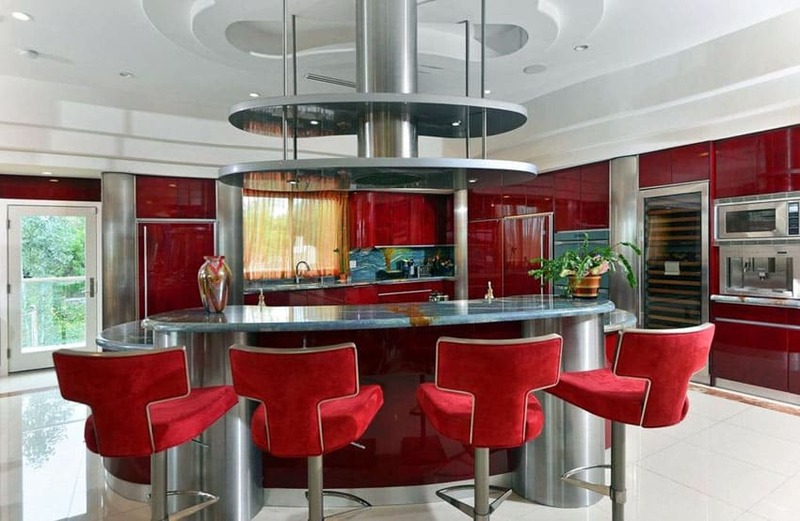 See how red can be utilized for red kitchen cabinets, decor, islands, chairs, and bar stools to create an appealing cooking space. 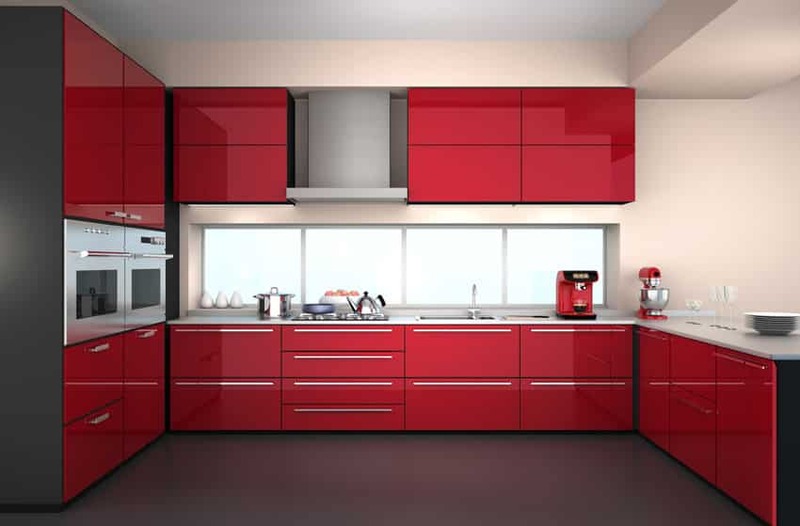 A power color and the color of love, the crimson color inspired modern kitchen in the picture above, draws attention to the lacquer cabinets in high gloss finish. 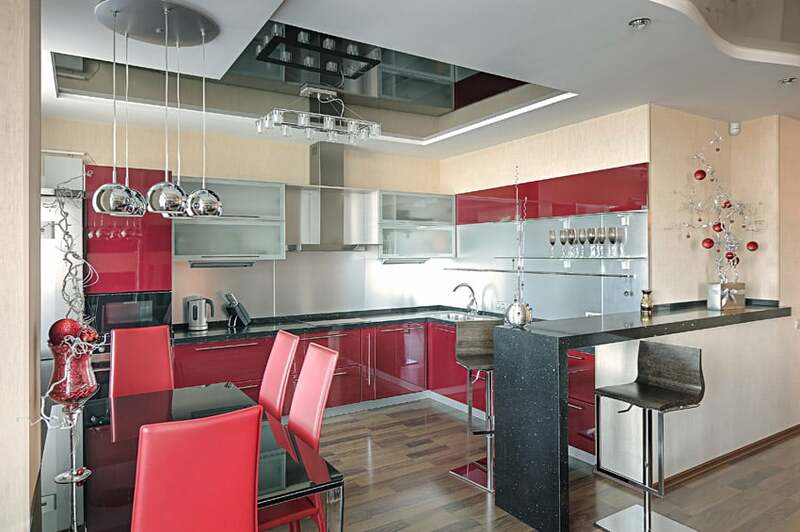 These crimson cabinets work well with the gray dining peninsula, gray solid surface countertop, stainless steel kitchen faucet and appliances, chrome finish bar stools, metallic silver lighting fixtures and other accessories. The medium tone laminate floors give that extra balance of creating a unified stylish space. 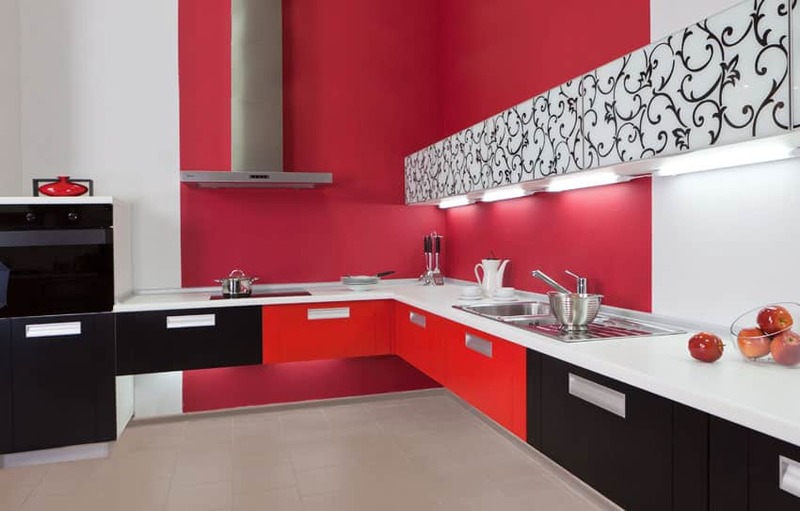 Our collections of stylish designs are RED hot ideas that would spice up any kitchen space. Studies shows that the color red is the hottest of the warm colors and an intense color which represents passion, love, excitement and energy to name a few. Red awakens our physical vitality, excites our emotions, stimulate the appetite and motivates us to take action. 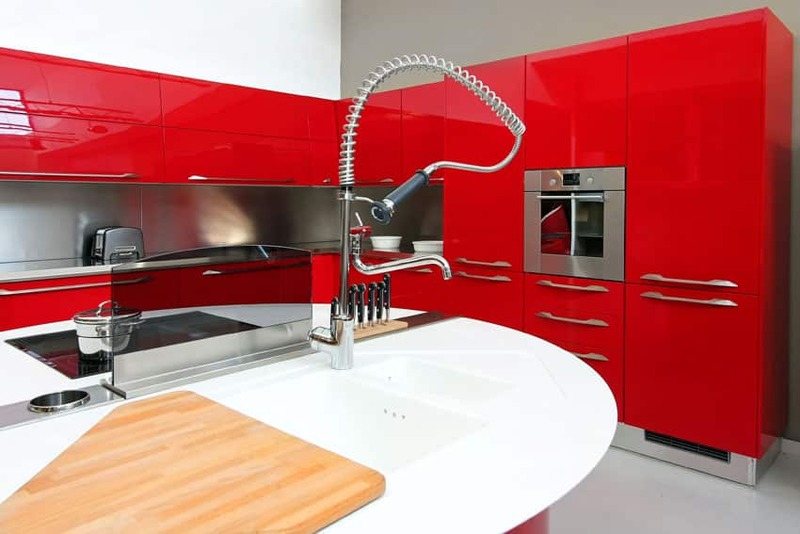 To balance the bold color red in various kitchen design styles, usually it is combined with different hues of neutral colors such as gray, white, black and brown. The color red could also be mixed with gold, green, fuscia and yellow for an eclectic color scheme. 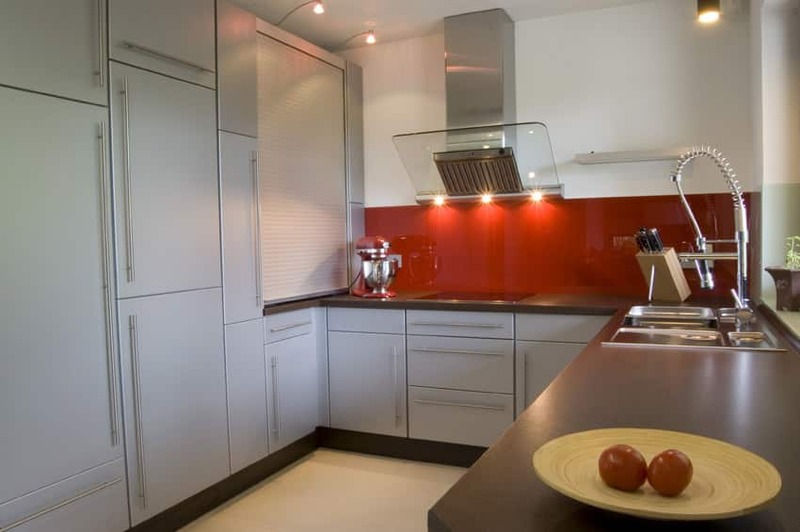 Contemporary and modern red flat panel laminated cabinet doors are simple yet very stylish. Laminates offers more variety of finishes and sheens. It’s also a perfect choice for those who are budget conscious but desires a sophisticated kitchen. Kitchen backsplash enhances the design style; and by featuring a red backsplash, it amplifies a sense of warmth and a refreshing vibe. 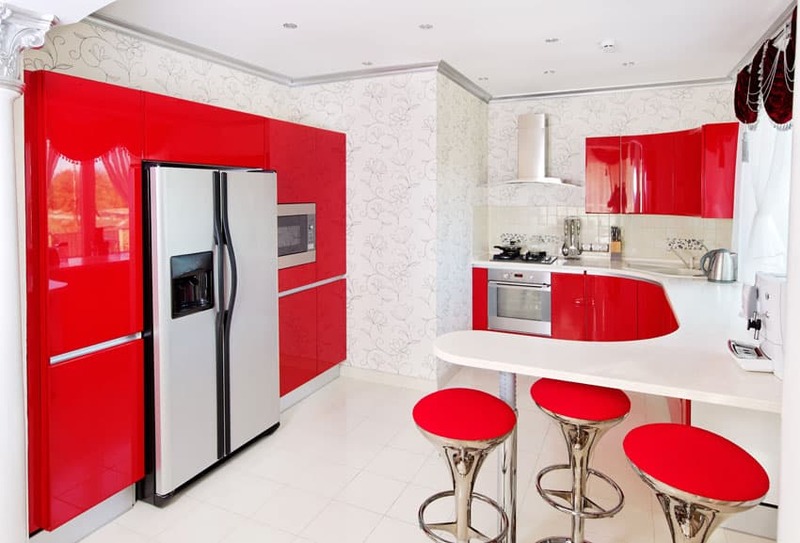 A red accent wall or feature wall, can provide an intense background and a visible color which enables to focus attention and allows other furniture pieces, cabinets, accessories and appliances to stand out. Traditional and classic kitchen designs often incorporates different hues of red to compliment a rustic and elegant design scheme. Modern and contemporary kitchen design ideas which includes wood cabinets, furniture and hardwood flooring create a comfortable, warm and welcoming ambiance. 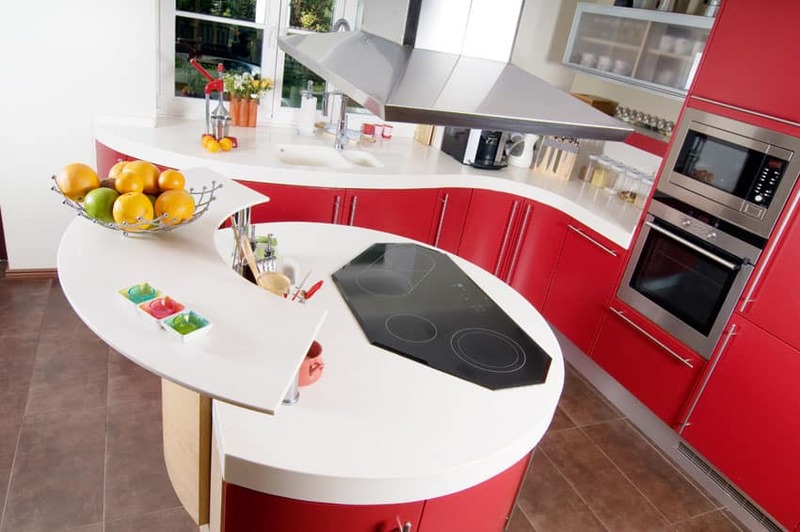 A stylish centerpiece in red such as an island can liven up the work space and change the appearance of the entire kitchen; while maintaining balance and retaining the room’s design style. Accessorizing with red may be a simple statement, but it is the easiest way to add a little splash of warm color and stimulates a high level of energy without overwhelming. Presented through bar stools fabric, kitchen appliances and dinnerware. 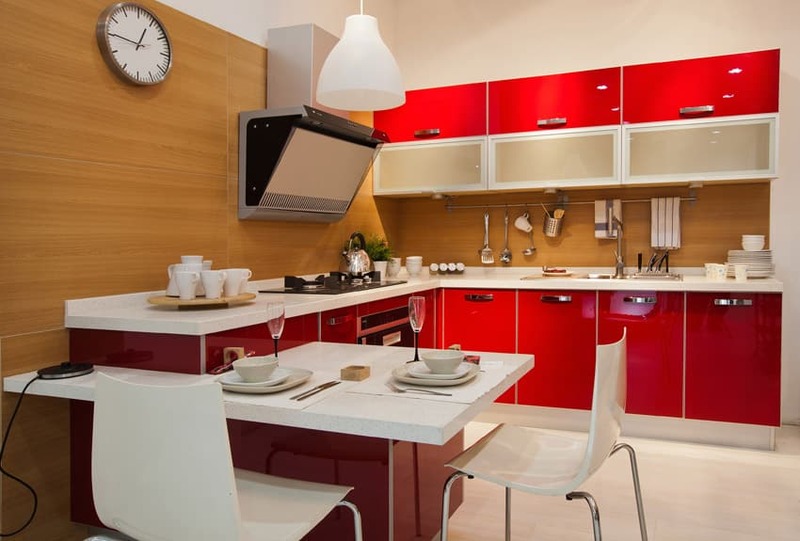 The following selections of trendy kitchen schemes will inspire you to try to experiment and play with various shades of the color red. It will help you visualize how to blend the warm color red and create your own unique and stylish kitchen space design. This sophisticated traditional kitchen is designed using China-red cabinets combined with medium tone raised-panel cabinetry with granite counter top which extends to the large island dinning counter. The patterned tile backsplash and area rug carry out the red motif design scheme. The solid wood ceiling beams with skylight, wood flooring and hanging pendant light warms up this luxurious kitchen. Set in a white backdrop, this sleek modern kitchen features ruby-red high-gloss finish flat panel cabinets combined with the classic white Corian countertop and ceramic tile backsplash. The white ceramic tile flooring, dining chairs, glass dining table, stainless steel appliances and feather pendant lights provides a perfect balance to this stylish and modern kitchen scheme. 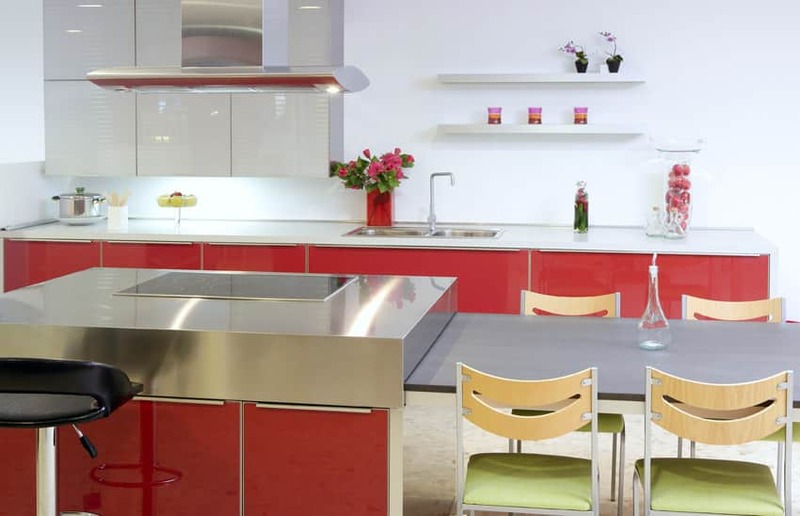 Sleek European style flat-panel cabinetry in Venetian red high-gloss finish combined with silver-gray matt finish cabinets provides great functionality and streamlined look. Full mosaic tile backsplash by the cooking area features a focal point and creates winning accent wall. Stainless steel appliances, modern lighting fixtures, ceramic tile flooring and black granite countertop shows a typical European minimalist kitchen design style. Burgundy colored walls? Look closely and you will notice floor to ceiling high-gloss lacquer flat panel cabinetry. A modern design scheme which features a gray granite countertop for the breakfast bar island which makes the preparation station and dining space prominently separate from the surrounding cabinetry. To achieve the perfect modern touch, stainless steel appliances, pillars and island support were incorporated. Blood red upholstery for the bar stools ties up the whole design scheme. 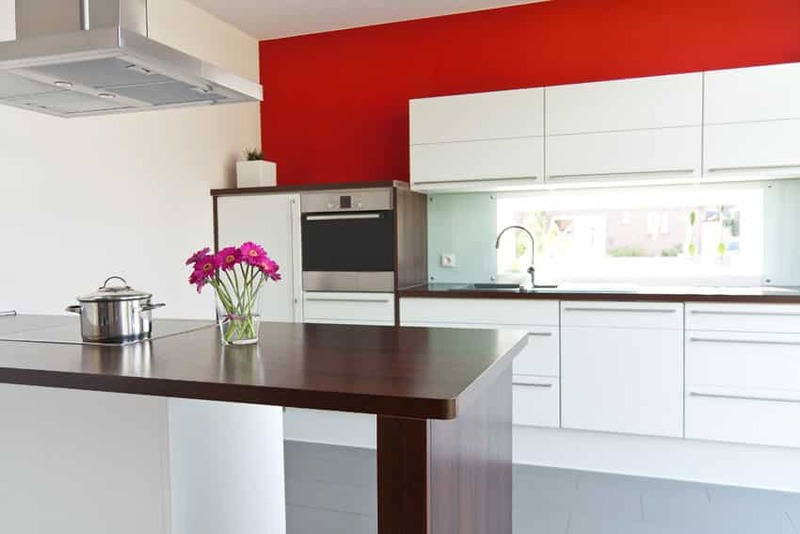 This modern kitchen features a Venetian red high-gloss flat panel cabinetry for those who prefer a shade of brown color scheme with a tinge of red. Beige granite countertop works best combined with black accent color for the baseboards, cornice, drop ceiling and bar stools. White ceiling and walls provides the perfect backdrop, making the cabinetry stand out more. Stainless steel appliances are the excellent choice for this stylish kitchen design. 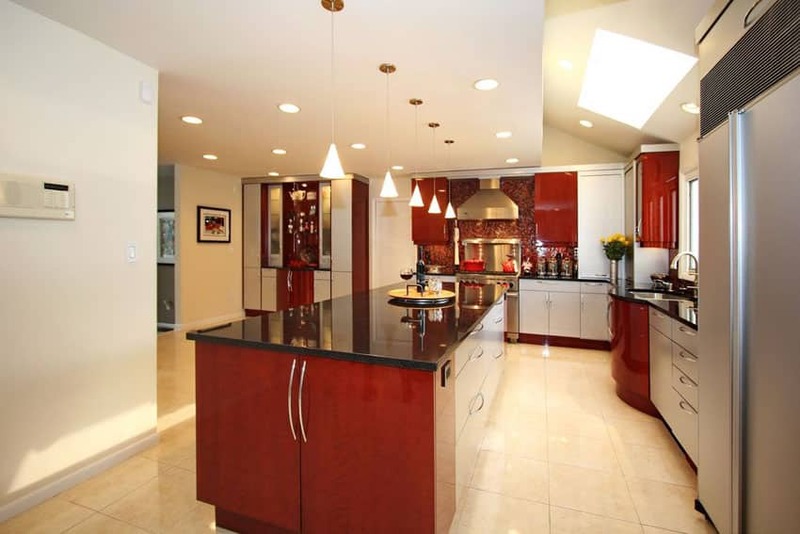 High-gloss crimson red flat panel cabinetry is a brilliant choice for this chic and modish kitchen. The color crimson was originally worn only by wealthy individuals and known to be the color of love. 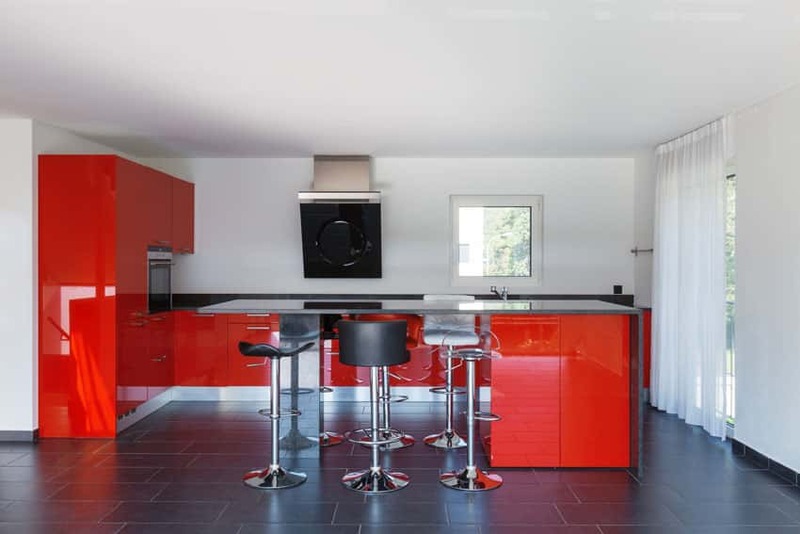 This bright red color with a tinge of blue combines so well with the black Corian countertop and stainless steel appliances. The beige ceramic tiles for the flooring and backsplash balances the color scheme providing a fresh and contemporary design idea. This galley style kitchen layout features a modernistic and stylish cabinetry. 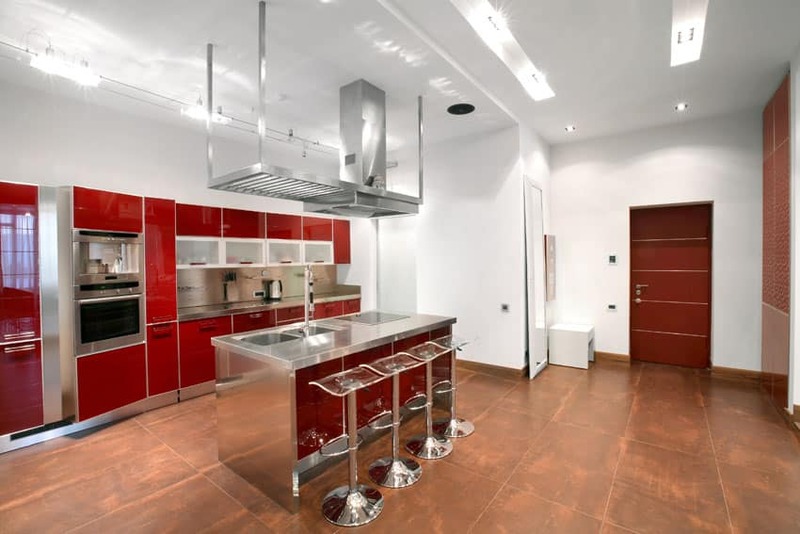 These sleek high-gloss blood red flat panel cabinets with brushed nickel round pull handle, stainless steel countertop and medium tone wood flooring combine luxurious beauty with the outstanding functional benefits for this trendy kitchen design. The elegant mosaic backsplash reflects different shades of red and golden yellow drawing together the whole color scheme. 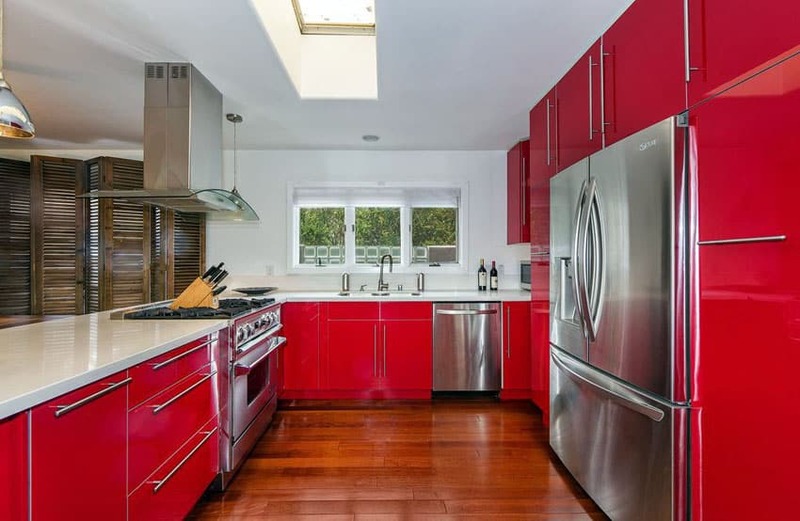 These sleek, floor to ceiling bright red high-gloss acrylic flat-panel cabinetry increase the visual impact of this trendy U-shape kitchen design idea. The play of colors as seen in the cabinetry and white solid surface countertop are matched with stainless steel appliances and neutralized by the white walls and light maple wood flooring. 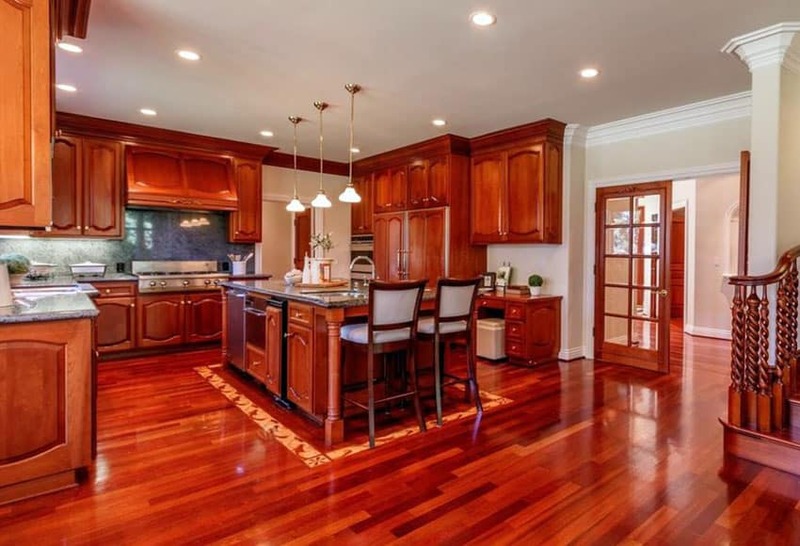 A traditional style inspired kitchen features the Brazilian cherry wood used in both the cabinetry and flooring which provide a warm and cozy ambiance. These raised-panel kitchen cabinets and island has gray granite countertop incorporated with stainless steel appliances balances the design scheme. Red color is said to make you hungry and increase one’s appetite. Tomato red color scheme for this kitchen is a perfect color choice for those who loves to eat and to those who are so passionate to cook. The neutral color of gray granite countertop, gray panel cabinets and backsplash, frosted glass sliding wall panel cabinets, light natural stone flooring and stainless steel appliances offsets this vibrant kitchen creating a gutsy and stylish kitchen design. 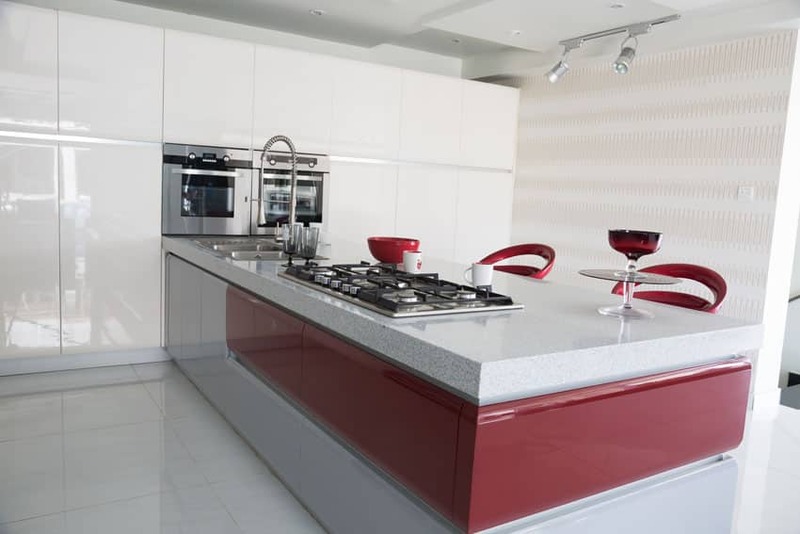 Turn up the heat in this chic and trendy kitchen with blood red high-gloss flat panel cabinets with polished chrome handles combined with white countertop. A small breakfast nook, tiled wall and backsplash work well together in this small space making it a cozy place for preparing, cooking and dining. This state of the art kitchen design style is perfect for a very limited space but needs to make a statement on its own. The white ceiling, walls and floor are an excellent backdrop for this stylish centerpiece. A custom-built curved peninsula in fire engine red creates a functional work space and invigorating centerpiece. White countertop, stainless steel appliances, black bar stools and raised dining counter accentuate the color scheme. White and gray are the perfect colors to combine with red – these are classic color combo, and they are great for a kitchen color scheme. A touch of yellow, apple green and black for accent colors work just as well with the scheme. The stainless steel countertop on this island is perfect for the built-in cook top and the attached dining table is as functional. 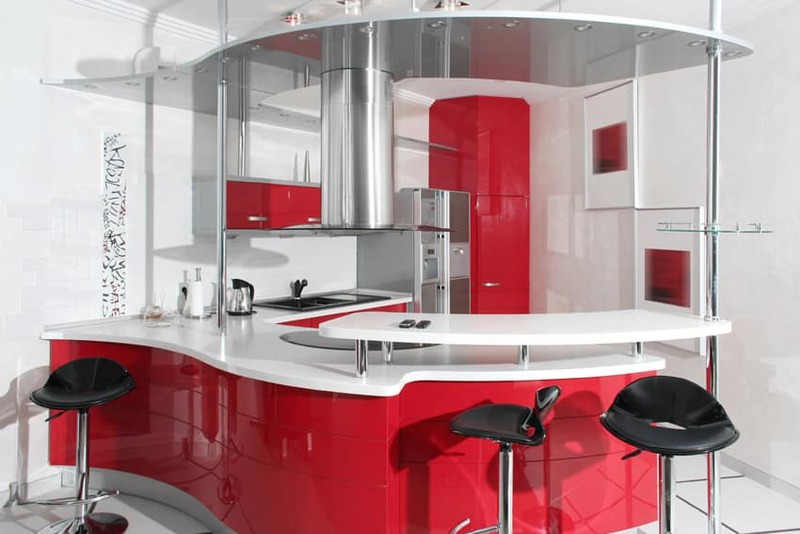 This U-shape kitchen design shows another way to showcase the same impact of the bright blood red color. These sleek smooth high-gloss lacquer finish cabinetry, with polished chrome plated pull handles and dark flooring will give your kitchen a very trendy appeal. 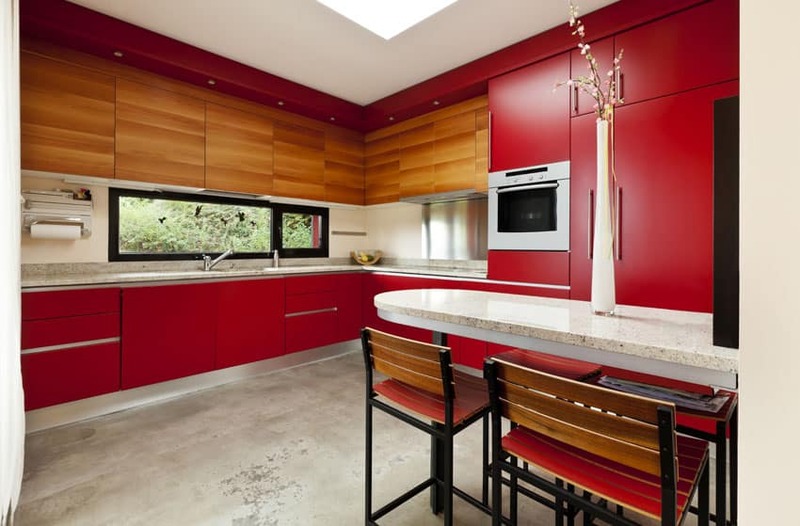 This U-shape modish kitchen shows another idea how to brave a strong shade such as this tomato red glazed backsplash by the cooker and preparation area. White flat panel cabinetry and light tone flooring combined with a dark gray solid surface countertop and baseboard are perfect combination to let the intensity of red to stand out. 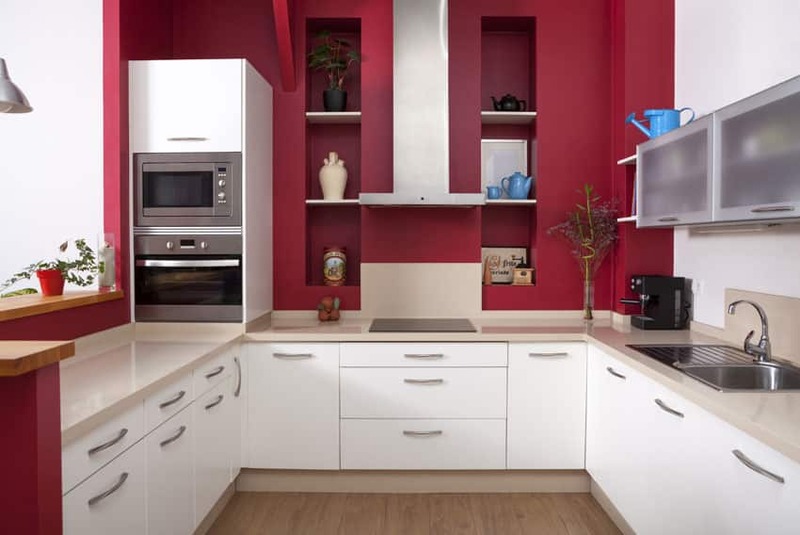 Red kitchen ideas that use red and white are a popular color combination that offers satisfying results. 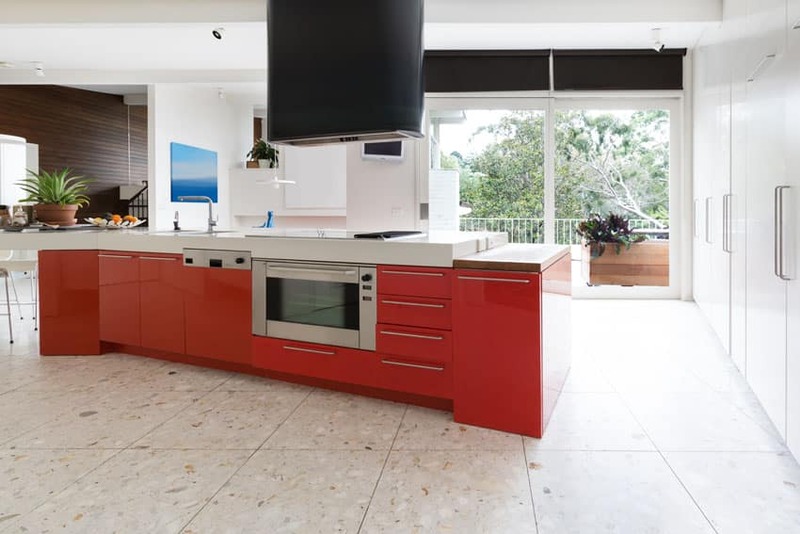 Here is a striking red-hot modish theme: sleek high-gloss lacquer flat panel cabinetry, combined with stainless steel countertop and backsplash. The light neutral colored walls and flooring are the ideal backdrop which makes these fire engine red cabinets to stand out. White Corian countertop for the kitchen island, stainless steel appliances, pull handles and accessories completes the whole design scheme. Red, White and Black color scheme inspired modish kitchen features a sleek blood red, flat panel cabinetry in high-gloss laminated finish, backdrop of white ceiling and walls, dark gray ceramic tile flooring and jet black granite countertop. This trendy kitchen design and layout incorporates function and style for food preparation, cooking and for entertaining. A chic eat-in kitchen guaranteed to enhance your senses. Practical and elegant curves in fun red color provide stylish storage space. The contour curves of the cabinets create a functional feature and character. The flat panel cabinetry in matte finish is so trendy that it is a far cry from the usual high gloss finish, yet still appears to be modish. Raised bar, white solid surface countertop. built-in cook top, brushed nickel pull handles, stainless steel appliances and medium tone ceramic tile flooring are perfect elements for this design scheme. 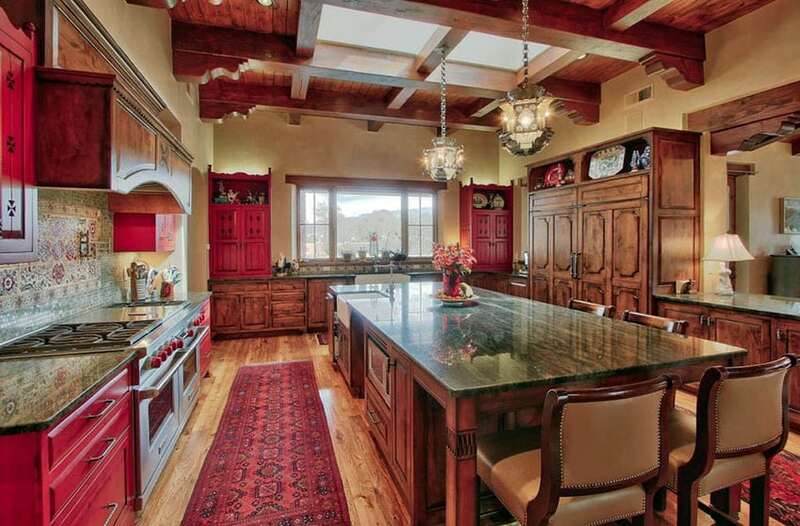 This large kitchen island functions as the preparation, cooking and dining area. White solid surface countertop and streamlined handle-free cabinetry in high-gloss finish create an ideal and modern style kitchen with maximum design functions. 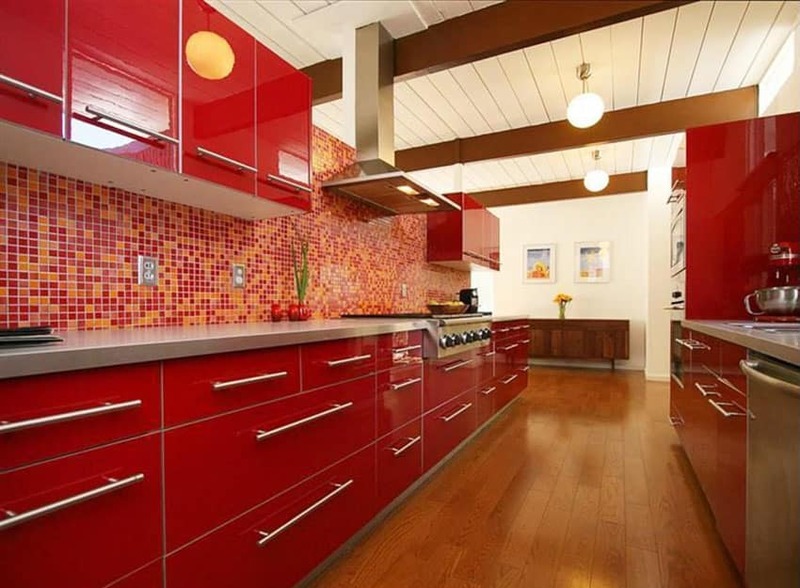 Bold red accents are the perfect way to add color and character to this kitchen design scheme. The kitchen is the heart of the home; it is where wonderful memories of being together and sharing a delicious home cooked meals. Inspired by the warmth and love, this blood red flat panel cabinetry in matte finish is perfect for creating a modern look and never seem to date. By combining it with wood finish laminate, it adds balance and builds character to the design style. Simple elegance and very stylish. By using the classic white flat panel kitchen cabinets with sleek stainless steel pull handles and high-pressure laminated countertop which extends to the island bar counter; this design style goes out for the trendy and modish scheme. The red accent wall makes a statement by pairing it with gray flooring. Two-tone red and black hanging base cabinet with white solid surface countertop, red and white wall and custom designed wall hanging cabinet panels are the main features of this eclectic style kitchen. Modern appliances and accessories add balance to the design scheme. Fun, cool and entertaining ideas for your next kitchen renovation. Typically, if you are using two-tone cabinets – the light color cabinets should be on top and the darker tones should be on the bottom to ground the space. 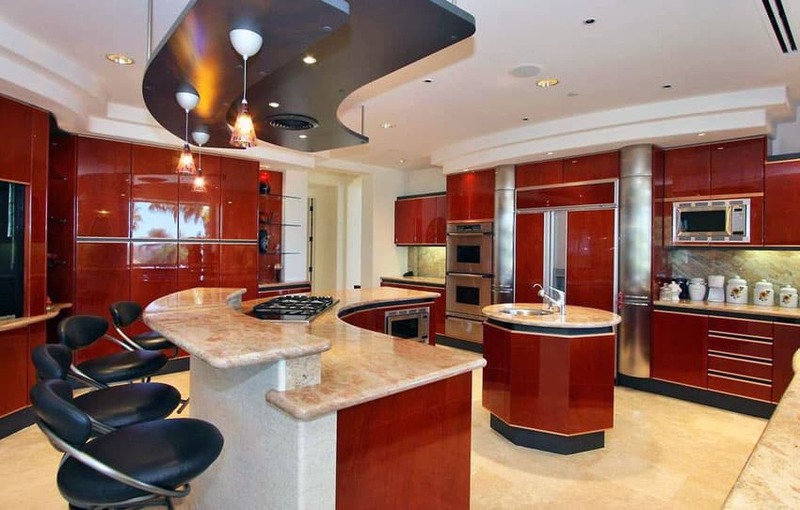 In this U-shaped kitchen design, notice that the base cabinets are in white high-gloss lacquer finish with cream color solid surface countertop; and the accent wall is painted in deep red wine color. These are compensated by incorporating a tall counter cabinet for the appliances; painting the wall by the sink area – white and installing medium tone flooring. 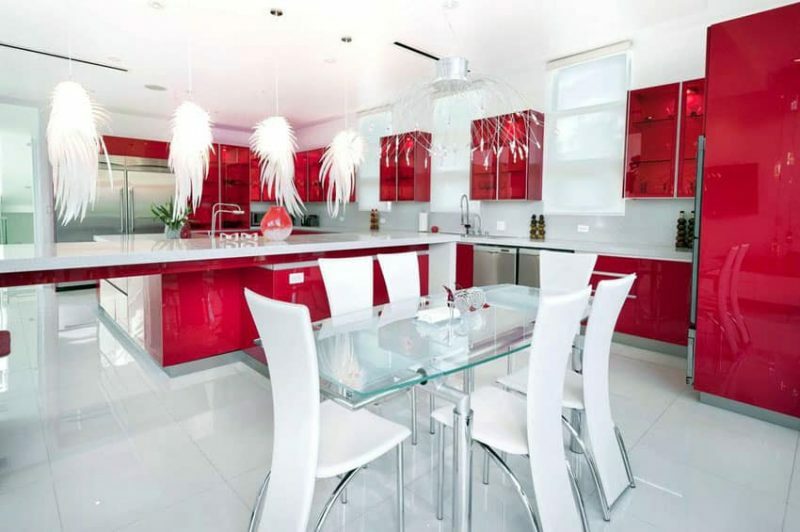 This stunning bright red high gloss lacquer finish kitchen cabinets and bar stools stands out amidst the backdrop of white patterned wall paper, cream colored ceramic tile back splash and white tile flooring. 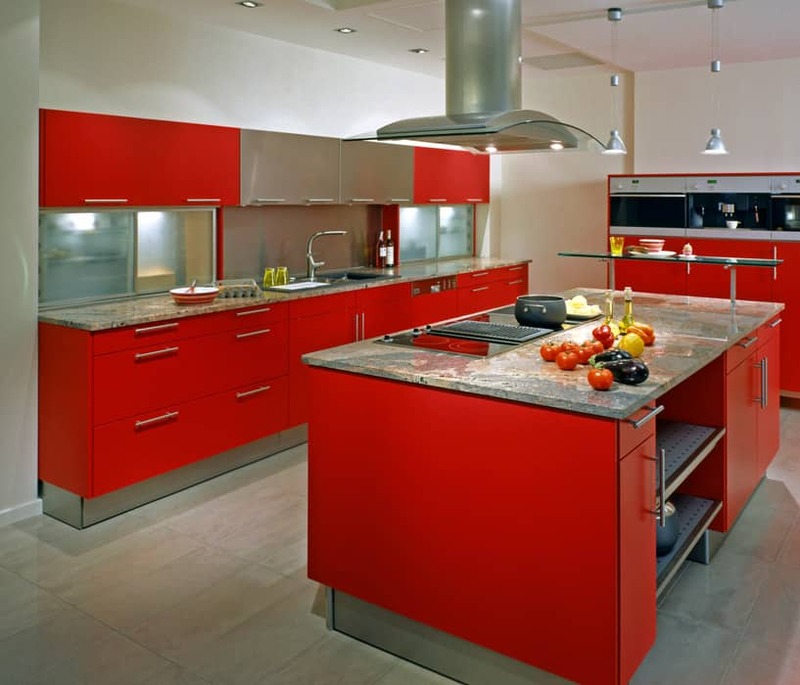 Some of the best red kitchen ideas fully embrace the color and make it the main attraction. Take inspiration from this island bar counter using high-gloss laminate finish in red tomato color, which allows the different working areas to be defined. The island bar visually separates the kitchen area from the other parts of the house and provide a focal place for gathering.